Linear A fragment PH 7 (Phaistos), entirely inscribed in Mycenaean-derived New Minoan, is definitely a religious incantation. It is fascinating to note that the incantation is highly reminiscent of the Christian mass or communion, call it what you will. The priestess pours water, udiriki (instr. sing. ), from a cup, dipaja (gen. sing.) and offers jatimane or the blessed bread of healing to her suppliants, while the whole ceremony, apparently conducted in a small shrine, is illumined by a firebrand. What a lovely, intimate picture of a scared religious ceremony this draws! 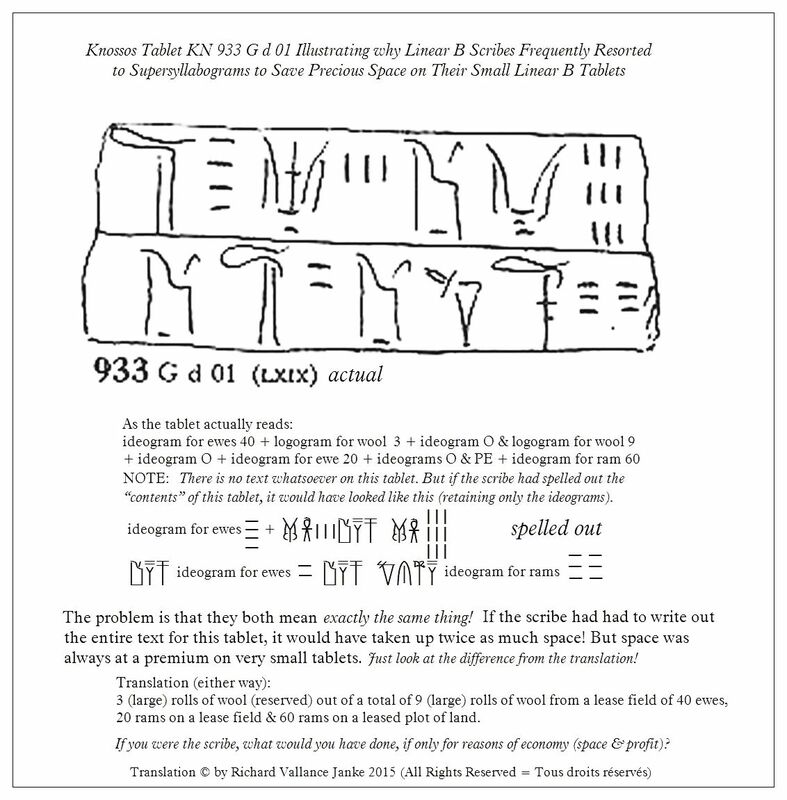 This is the most comprehensive article (28 pages long) ever written on the decipherment of this key Linear B tablet. You can download it from academia.edu at the link above. It did not take me long to find yet another Minoan Linear A for a specific type of vessel, the meaning of which was quite easy to break through. This is the term dawe?da (of which the second syllable may not be we at all) since that syllabogram is missing from the W series in Linear A. The ideogram is clearly that of a 2 handled cup, and one of the photos I found of a 2 handle cup was that of a Minoan kylix. So that accounts for my translation. There are of course other types of 2 handled cups, such as kraters, but it strikes me that the latter type came later and are more likely to be Mycenaean, since kraters are commonly understood as being Greek. I do not know the numerical designation for this tablet or its provenance; so if anyone can come up with it and inform me, I would be most grateful. The Minoan Linear A word kuro unquestionably means “total”, primarily because it is always followed by numerics, sometimes in large numbers. It is of course the equivalent (though not exact) of the Linear B tosa = “so many”, i.e. “total”. I say not exact, since the Mycenaean Linear for “total” is plural, and I strongly suspect that the Minoan Linear A counterpart is singular. I am also of the opinion that Mycenaean Linear B inherited syllabograms which always end in a vowel directly from Minoan Linear A, because I am firmly convinced that Minoan Linear A words always ended in a vowel, never a consonant. Since the Mycenaean Linear B syllabograms all end in a vowel, whereas Greek words almost never do, terminating instead in consonants, it stands to reason that the Linear B syllabary is a direct calque on the Linear A syllabary. The newly ensconced Linear B scribes at Knossos simply took over a big chunk of the Linear A syllabary, without even bothering to account for Greek ultimate consonants. This may look weird or positively perverted to us, but we must recall that the scribes, many of whom worked in the transition period from Minoan Linear A to Mycenaean Linear B, would not have wanted to “re-invent the wheel”. After all, both the Linear A and Linear B tablets were first and foremost inventories, so why rock the boat? The older Minoan scribes had to learn Mycenaean as fast as possible. They must have found Mycenaean very strange to their ears, since almost all of the words ended in a consonant. Be it as it may, it appears the younger scribes were quite willing to adapt the Minoan Linear A syllabary willy-nilly, and have done with it. CONCLUSIONS: All of the Mycenaean Linear B syllabograms inherited from Minoan Linear A end in vowels, in spite of the fact that (even archaic Mycenaean) Greek words almost always end in consonants because, in short, Minoan Linear A words (probably almost) invariably ended in vowels. If this is the case, this amounts to an extremely important discovery over the nature of the Minoan language. As far as I know, no previous researchers in Minoan Linear A have ever taken this basic premise into account. But I stand my ground on this one. Finally, since almost all Minoan Linear A words probably ended in an ultimate vowel, the word kuro is very likely to be either masculine or neuter, based on the (untested) assumption that gender in Minoan Linear A would have assigned O ultimate to masculine or neuter and A ultimate to feminine ultimate. However, fair warning! There are a great number of Minoan Linear A words which terminate in U ultimate, and these may be in the masculine, while those words ending in O may be in the neuter, or vice versa. I shall have to test this hypothesis over the next few years, as I attempt to gradually decipher at least some Minoan Linear A vocabulary. I shall also be addressing other key characteristics of Minoan Linear A orthography in future posts. On the Mycenaean Linear B tablet tosa pakana = “so many swords” i.e. “the total” number of swords, tosa is in the plural, the exact opposite of kuro in Minoan Linear A, at least if my hypothesis is right. Another consideration I would like you all to take into account is this: I personally do not care one jot what class of language Minoan Linear A falls into, whether or not it be Indo-European, for reasons which will become crystal clear in near future posts. In a nutshell, it is precisely because almost all philologists and specialists in Minoan Linear A try to pigeon hole the language into a particular class of languages that they are getting nowhere with its decipherment. Why not instead just accept the language for what it is( whatever it is! ), by gradually deciphering as many words as we conceivably can, even if these amount to no more than a couple of dozen or so and, in addition, by reconstructing in so far as possible the grammar of Minoan Linear A, which may in turn provide further clues to other “undecipherable” vocabulary. You never know. Decisive proof that the word Minoan Linear A supaira is a small(er) vessel type, approximately equivalent to the Mycenaean Linear B word dipa = “cup with handles” arises from another highly significant Minoan Linear A tablet, and that one is the tablet from the Ay. Nickolaus Museum, Greece. There are 300 of these cups on Linear A tablet Haghia Triada 31, so we know they are small. What is so amazing about the Ay. Nickolaus Museum Linear A tablet is that it confirms beyond a shadow of a doubt that Mycenaean Linear B inherited its supersyllabograms from Minoan Linear A! There are no fewer than 6 supersyllabograms for vessel types on this highly significant tablet. The very first one is that for supaira = “cup”. 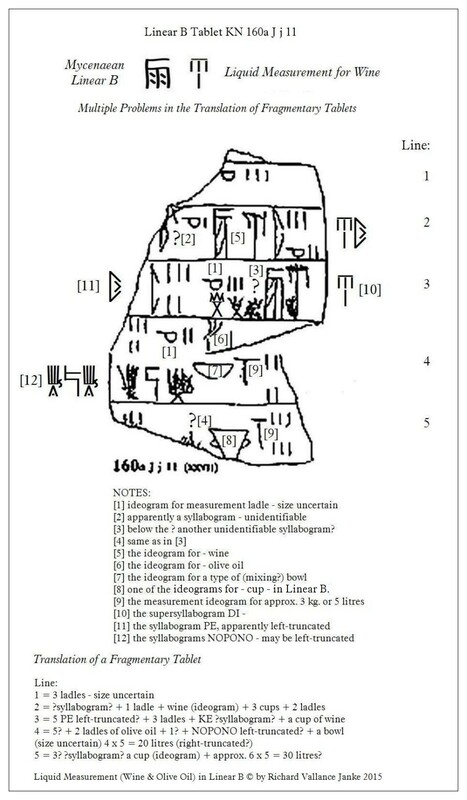 What is even more astonishing is the fact that this supersyllabogram, SU, is incharged inside the ideogram for this vessel type, once again confirming that Mycenaean Linear B inherited not only its supersyllabograms, but even its ideograms, from Minoan Linear A. Now we now for certain that the word supaira on HT 31 (Haghia Triada) is a vessel type, because it appears as an incharged SSYL on the Ay. Nickolaus Museum Linear A tablet. But that is not all. We also know that it is a cup with a handle, because the Ay. Nickolaus tablet shows it as such. So supaira definitely means “a small cup with a handle”, very much like the famous Mycenaean Nestor’s cup at the National Museum of Athens, even though the latter has two handles. This makes for the second extremely precise definition of a Minoan Linear A word for a vessel type, the other being puko = Mycenaean Linear B tiripode = “tripod”. The practice of incharging attributive supersyllabograms inside their ideograms is a Minoan Linear A invention as well. So the Mycenaeans did not invent supersyllabograms, nor did they innovate the creation of incharged attributive supersyllabograms inside their own ideograms. The Minoans did all that! 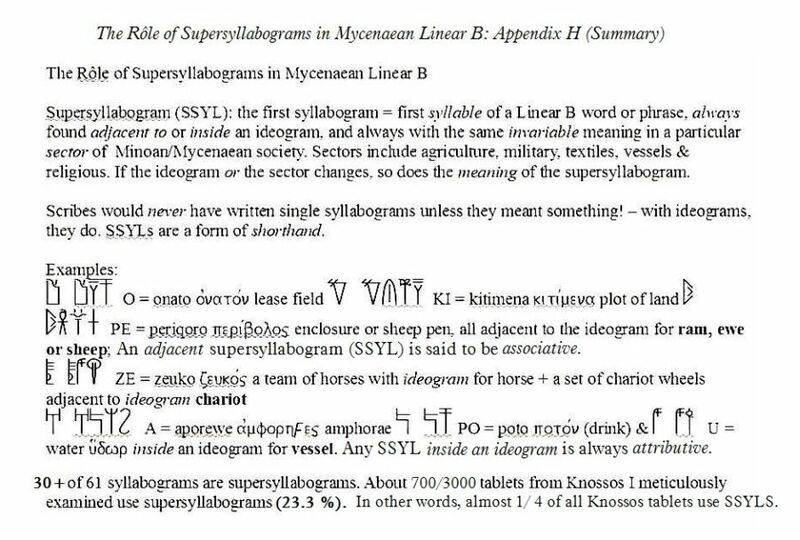 To confirm beyond a doubt that the Mycenaean Linear B practice of incharging attributive supersyllabograms is derived from the Minoan Linear A practice, cf. the Linear B table of incharged supersyllabograms below. This is a particularly fascinating fragment. First of all, I never imagined I would ever be able to find a  picture, and better than that, an actual fresco of a Minoan camp stool or footstool. Mais une fois l’affaire cherchée, les voilà trouvés, deux tabourets exquis ! Once searched, once found, two exquisite stools! Just my luck. Secondly, have a look at the scribe’s hand. Beautiful!... especially the way he stylizes NU. Three florid variations on just one syllabogram. For that matter, the same phenomenon recurs with RA. He must have been in love and wanted to give a least one of the footstools to his darling. Just kidding! Quite impressive and quite an impressive fragment, unique, one of a kind. The difficulty posed by this ideogram for a “ladle” arises from the fact that we have no idea of the size of ladle (if that is what it is) the Linear B scribes were referencing. This problem is exacerbated by further considerations below. I am unable to accurately identify the syllabogram on the left side of this line, which is itself apparently the last syllabogram of a word in Mycenaean Linear B. This particular problem is not script-dependent. The syllabogram following KE is illegible; the two-syllable word cannot be recovered. Same problem as in , although in this case the syllabogram, if it is one, is chopped off from the middle down. Such problems are endemic to fragmentary tablets, regardless of script (not script-dependent). The ideogram for “wine” in Linear B is very easy to spot & identify. It is also commonplace. The ideogram for “olive oil” in Linear B is very easy to spot & identify. It is also commonplace. This is just one of the ideograms for “bowl”. Once again, we are confronted with the same old dilemma, which keeps popping up all over Linear B tablets. What kind of bowl is this? Once again, the scribes all knew perfectly well what kind of bowl this ideogram referenced, just as they knew precisely what all other ideograms in Linear B meant (mean). Unfortunately for us in the twenty-first century, the precise meaning of scores of ideograms is beyond our ken. When I refer to meaning, I do not simply mean, “This is a mixing bowl.” - “That is a soup bowl” - “This is a cereal bowl” etc. Far from it. Whenever the Linear B scribes referred to any kind of vessel: cauldron, cooking pot, bowl, cup, jar, jug, vase (including amphorae) etc. etc., they identified each and every type not only by its specific type (nomenclature), but by its capacity (liquid or dry measurement), and its primary function. That is a lot of “definition” to cram into one ideogram. And this is precisely why we will probably never be able to accurately identify the type of vessel so many ideograms refer to, because we were not there when the scribal guild assigned standard names married to standard measurements to identify and classify each and every ideogram. (a) Since ideograms are by nature semi-abstract, we can never be really sure that any particular ideogram we assign to any particular vessel type actually does correspond to “the real thing”. It is always a best-guess scenario. But it is better than nothing, and in some cases, at least, the semi-abstract ideogram may look well enough alike the actual vessel to confirm the former with reasonable accuracy. (b) Since several ideograms for vessels in Linear B look almost exactly the same, this poses yet another dilemma. What are the sizes of similar ideograms? - in other words, what dry or liquid volume are they intended to hold, as the function of measurement alone? (c) There is also the very real question of the kind of function for any vessel. 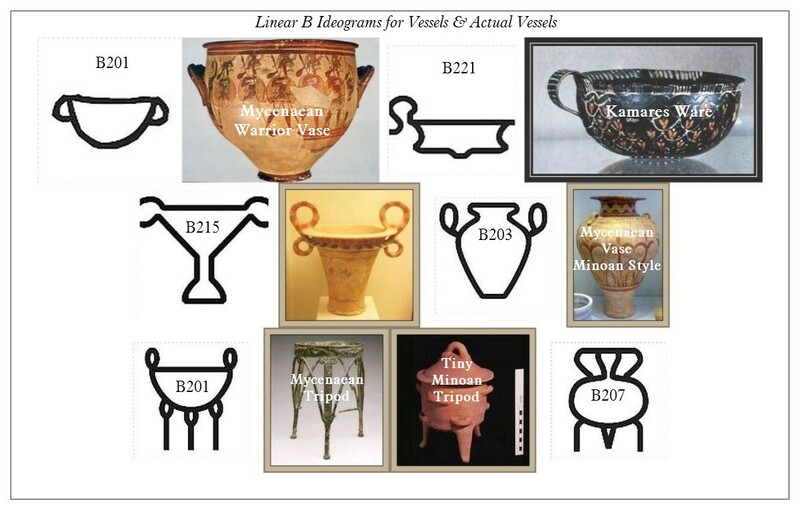 While the ideogram for some vessel look-alike types may refer to cooking vessels, pots, pans, utensils etc., others in the same run of ideograms may be symbolic of higher class, palatial and even royal vessels, such as silver and gold cups (dipa), bowls, plates etc. I am sure our resident archaeologist, Rita Roberts, can think of other distinctions and functions of various Linear B look-alike ideograms and of their corresponding “real ware” than can I. Or perhaps we could assign the modern counterparts, “software” to ideograms and “hardware” to archaeologically identified vessel types. See . Same difficulty. The most glaring problems with this ideogram are the size of the cup, and in particular, its function. Is this just any old cup or is it silver-ware or even gold? Who is to say? No one today. But you can be sure the scribes knew exactly what kind of cup this ideogram refers so. Here is where things get really messy. According to Andras Zeke of the Minoan Language Blog, the T style logogram is supposed to reference dry measure only, and is meant to be the equivalent of approx. 3 kilograms (give or take). But on this tablet, the T measurement refers to liquid measurement for wine and olive oil. This appears to be another contradiction in terms. To further complicate the matter, the amount of wine measured appears to be quite voluminous, at some 4 x 5 = 20 litres in the first instance (if it is not right-truncated!) & 6 x 5 = 30 litres in the second. Someone must have thrown a huge party, and lots of folks must have got drunk as skunks! Or else Andras Zeke is wrong. This is all the more likely to be the case if we take into account the amount of liquid a ladle can hold – as in  above and in particular, how much a ladle of olive oil is supposed to be – as in  above. Those measurement standards  &  are way out of kilter with those for kilograms (dry measurement) or perhaps litres (liquid measurement) in . How can we possibly square the small measurement standards for olive oil with the voluminous ones for wine on this tablet, without ending up in a morass of contradictions? - unless of course whoever wrote this tablet meant to say that the “the recipe” (if recipe it is) called for adding a small amount of olive oil to a heck of a lot of wine. Such a combination makes no sense to me, but I am no archaeologist. So my archaeologist colleagues and friends... come to the rescue! But then again, Andras Zeke is still right, and we are missing implicit rather than explicit details of the nature (type, volume & function) of any given ideogram for vessel. This is clearly the supersyllabogram DI, which almost certainly refers to the Linear B word for “a drinking cup” or dipa in the specific context alone of ideograms for vessels. But it might also designate the function of the cup, which would be representative of any of the Linear B words beginning with diwo or diwe, in other words, to the God Zeus or possibly even Dionysus (also beginning with DI). In that case, the cup is a libation cup. However, the first meaning is the more convincing of the two. When used in a religious context, the supersyllabogram always takes on the latter meaning. This is the syllabogram PE, apparently left-truncated. If so, it is impossible to recover the rest of the Linear B word of which it is the ultimate. This looks like a Linear B word, nopono (whatever that is), but once again, the word is almost certainly left-truncated, because the tablet is fragmented. So again, the word appears to be irretrievable. As we can all see from this tablet, any attempt at a reasonable or definitive decipherment or translation is next to impossible. However, it is our solemn duty as translators of Mycenaean Linear B to make the best of the not-so-good of all possible worlds, and to attempt a translation that reveals something of the true intent of the text as the scribe wrote it. This is what I always do, and have done here.